08 | June | 2015 | Troy C. Wagstaff aka CallahanWriter Blog: Topics of interest include Western Historical (1865-1899) Topics. Additionally inspirational Christian and Fibromyalgia interests. I have spent a great deal of time writing about fibromyalgia for the last couple of years. I have been surprised about the reaction to my Blog posts on fibromyalgia from all over the world. From South America to Africa, from Europe to Asia, From Russia to Australia and beyond. I have found it to be rewarding to write about my experience with fibro. I’ve enjoyed connecting with people that suffer from fibromyalgia. I continue to read and study about fibromyalgia which is helpful to me to understand this debilitating disease. I have also learned about the concept of invisible illnesses. That is where you have a serious chronic illness that most people don’t understand because they can’t see anything wrong with you. Since learning about the concept of invisible illnesses I have tried to advocate about that concept of illness along with my advocacy of fibromyalgia. InvisibleDiseases.com. Invisible diseases need to be taken seriously which means everyone needs to understand was invisible diseases are. You can learn a lot more about that concept by visiting their web site. 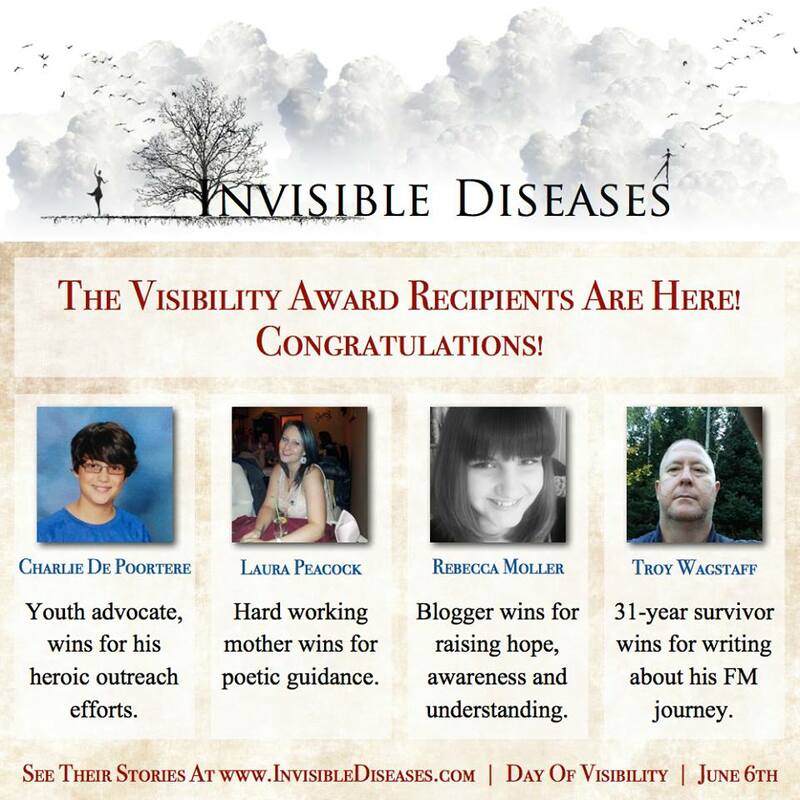 Thank you InvisibleDisease for the award. I also want to give a big shout out to my Christian Fibro family and it’s creator Darlene Blair Fibro, creator of my Facebook Fibro Family Christian Support Of OUR PURPLE OASIS ~ SECRET GROUP. I’ve been with them a long time and I value their support and understanding.